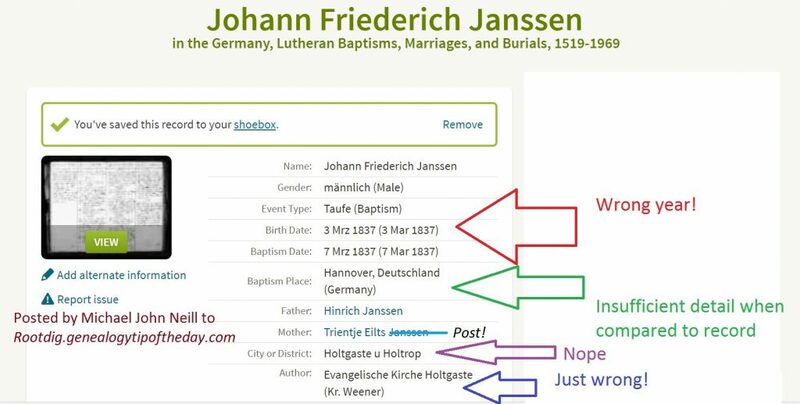 The “record” for Johann Friederich Janssen in Ancestry.com‘s “Germany, Lutheran Baptisms, Marriages, and Burials, 1519-1969” makes him the poster child for reviewing the original record before doing anything with a transcription someone has made of a record. 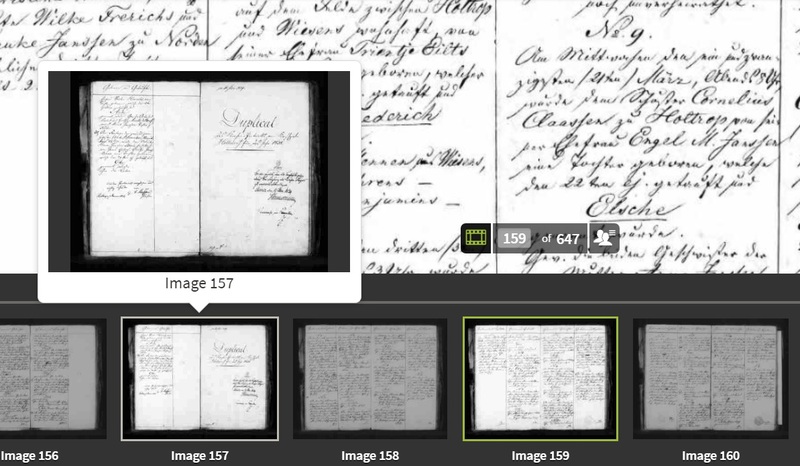 The records that have been digitized (at least for this village, but for many of the villages in Ostfriesland, Germany, where Johann was from) are actually duplicates of the original church records. The year of Johann’s birth is not given in the record. This is typical for church records of this era. However, maneuvering earlier in the records usually provides the user with the year of the record. The illustration in this post with “image 157” in the center illustrates how this was done for Johann’s entry. Johann’s entry was on image 159 of 647 for this set of images. Image 157 had the “cover page” for the year of entries in which Johann’s entry was included. 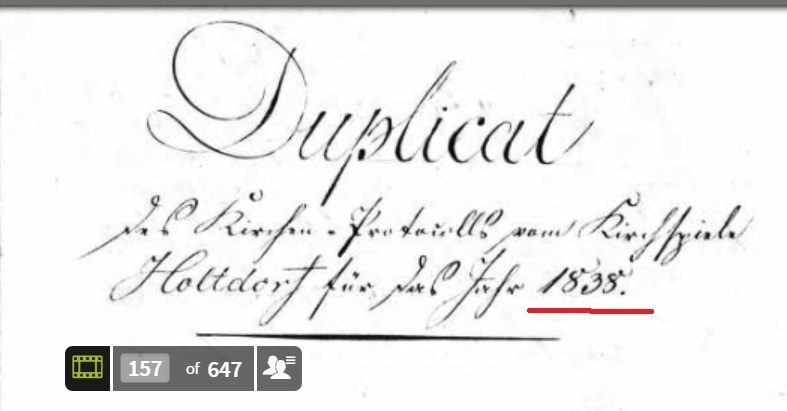 Viewing that image in more detail indicated that the entry for Johann was actually from a set of entries in 1838, not 1837 as indicated in the Ancestry.com transcription (Readers may note that Holtrop is styled as Holtdorf in this image. That’s an earlier version of this village’s name and not a separate location). The name of Johann’s mother was not Trientje Eilts Janssen. 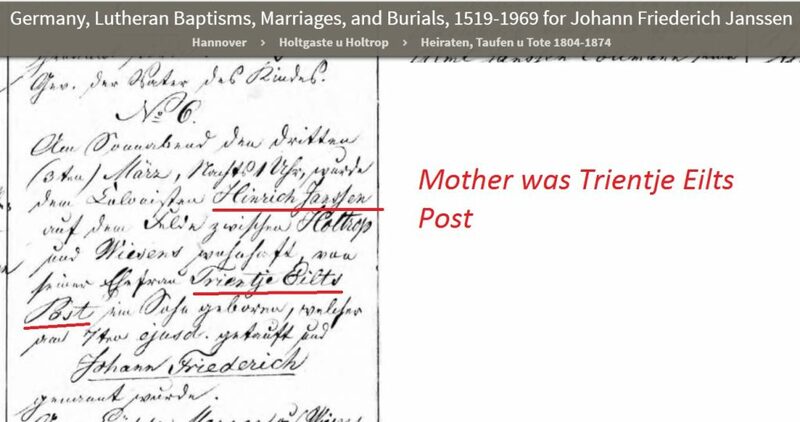 A reading of the entry for Johann indicated that the parents were named as Hinrich Janssen and Trientje Eilts Post. Maneuvering earlier in the images in this set of records confirmed the location and the dates of records that were included in those records. This confirmed that the village was actually Holtrop. That’s the location that should have been used instead of Holtgaste u Holtrop. The reason Holtgaste u Holtrop was used is the same as noted in an earlier post on these records–the records of more than one village were included on the microfilm from which this set of digital images was created. The author should have been the church at Holtrop. 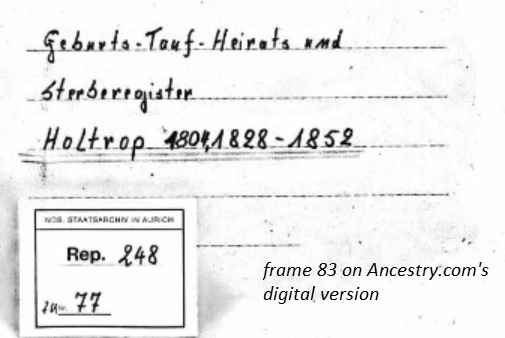 The “index record” created for these records by Ancestry.com should not be used for automatic import into a user’s database. Read the actual record. Use the “index record” as a guide for interpretation if necessary, but do not blindlessly use it without analyzing it yourself. 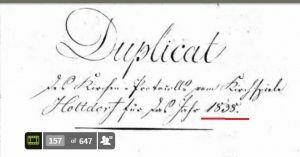 The database “Germany, Lutheran Baptisms, Marriages, and Burials, 1519-1969” greatly facilitates access to these records for those who have German ancestors during the time period the records covers, but the records must be used with care. This entry was posted in Uncategorized and tagged ancestry.com german parish records. Bookmark the permalink. ← Born in Wiegboldsbur u Wiesens?